You’ve put in all the challenging work to get your webinar up and running. You’ve driven traffic to the opt-in page. People have come and some even bought! Woohoo!! But what about those that didn’t come? Or didn’t buy? Don’t leave easy money on the table! 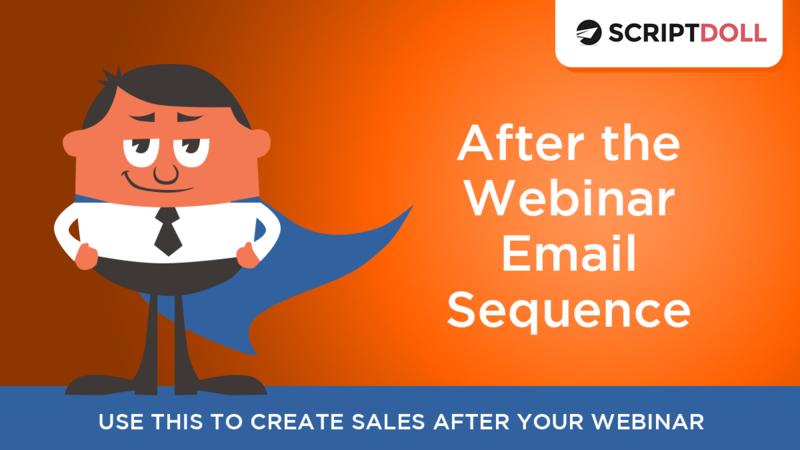 Send them an After the Webinar Email Sequence! And of course, we have a great one for you here at ScriptDoll! Our “After the Webinar” email campaign is an 8-email sequence, that can be used for a sales cycle of 4-7 days. This sequence starts by driving traffic back to your replay while adding a ton of value to your reader. After delivering all that value, the 4th email transitions to talking about the product you pitched on the webinar so even people who don’t watch the entire webinar get all the amazing details about your product. If you have a sales page up, use it. If you don’t you can send them straight to your cart (preferably your cart has a list of features & benefits, your guarantee, and a few testimonials on it like in our Checkout/Cart Trust Builder Sales Page). What’s in the After the Webinar Campaign? We have 8 emails strategically designed to add value to your reader’s life with even more value than you offered in your webinar, while also persuading them to watch the replay and click buy. Email 1 – The Replay Announcement – this email gives the replay along with some enticing reasons to watch it. Email 2 – The First Value Add – this email is super easy to plug into your autoresponder and delivers a huge value to your reader while also inviting them to watch the replay. Email 3 – The Webinar Learnings Value Add – this email is designed to give your reader the highlights of the webinar but not the details so that they are guided to watch the webinar if they haven’t yet. Email 4 – The Product Introduction – this email elegantly introduces the product you’re selling. Email 5 – The FAQs – this email handles all the objections and gives the detailed buyers all the information they could want. Email 6 – The Proof – this email drives home the emotion of your offer by sharing proof that it works even if your reader thinks it may not. Emails 7 and 8 – The Close – these emails are closing day emails, designed to get deadline dancers to click buy! We think so, that’s why we added it to ScriptDoll! If you have ScriptDoll, jump into the email sequence section of ScriptDoll now to create this script. Don’t have ScriptDoll? Click below to try it today!